Don't Feed The Planner! | Simple. I ONLY eat aid rations, you give money for Famine Aid in Africa. ~ Simple. I ONLY eat aid rations, you give money for Famine Aid in Africa. Now I must ask for the last push! With so little time left, I cannot help but think of every telethon in history, where the last few hours bring about a huge uptick in donations. You guys have taken this up to close to $7,200 USD. Since Cheil will match whatever we raise up to $10K, I’d love to at least get up to that much until tomorrow evening. That would of course still leave the project at about a fifth of the original target… But a lot more than any of us could have given on our own. Please! Call your friends, email them, tweet the hell out of this… Or just go to the UNICEF project site by clicking here and give what you can. We cannot stop the drought from happening, or fix the dreadful political situation in Somalia… But we can certainly prevent lots of children from dying. One does every six minutes today. Two since I started writing this, and one since you started reading. So, it’s really down to the wire now. If that’s all you needed to read, please click here to go straight to UNICEF and contribute. Even the smallest donation helps. Here we are, seven weeks to the day when I first went shopping for the famine ration project, quite unaware of what was ahead. In the end, we aren’t even close to the target, but the affection and love outpour have made it totally worth it. This project has inspired demonstrations of kindness that i never imagined —like children giving up their free time or allowances to pony up (seriously, children are way nicer than adults). I even got a super interesting proposal to continue what I’ve done, which I think is an excellent idea as we move @5050good into the launching and heavy fundraising period. 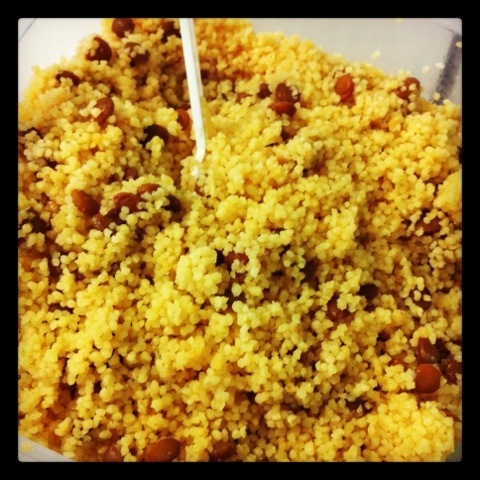 Below are two pictures: one is a close up of cous cous and lentils, which I shared with Mateo today. 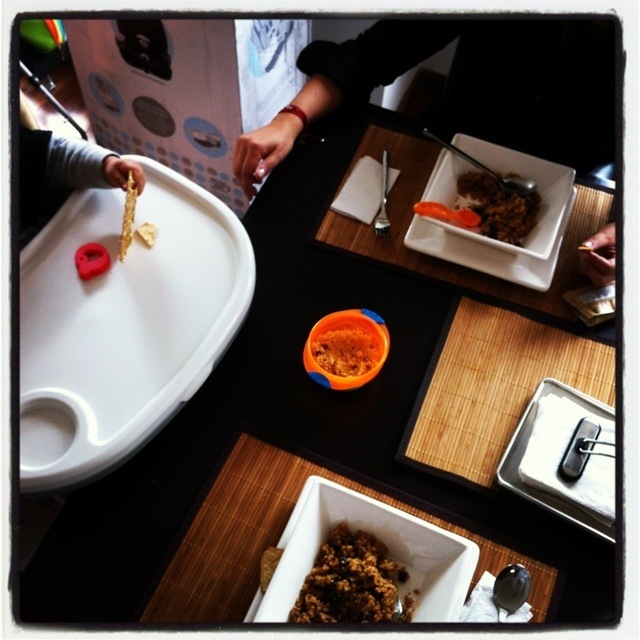 The other is an Instagram shot of our table today. Mateo, Monica and myself all ate ration food. Actually, my wife has been eating rations with me this week. She has not only been super supportive (in money and spirit!) of this whole project, but she’s also been one of my greatest evangelists (not to mention standing by me with what has likely been a crabbier mood than usual). I eat famine rations only for 50 days, you help us get to our insane ambitious donation target. Easy, huh? More info at 50/50 Good. Hey there… so, as the Fat Planner project winds down, and my anxiousness at the fundraising number winds UP, I am very happy to report that I was interviewed for a popular morning news telecast in Mexico: 1N with Carlos Loret. I hope this brings us some more attention to this blog, 50/50 Good, and the famine aid initiative in general. Here is the video from the interview. I really hope not to get sued! I just wanted to share with people following this blog who access from overseas. I will gladly remove the video from YouTube if asked to do so. All IP belongs to TELEVISA, and you can watch the original video from this morning newscast on Televisa’s site by following this link. If you want to help (I would love it!) you can click on the orange 50/50 orange logo to the left, or just click here to go straight to the UNICEF project page. We will be eternally thankful for your contribution and empathy. El día de hoy por la mañana, Carlos Loret mostró un reportaje que hicieron sobre mi proyecto en su noticiero 1N (gracias Carlos, Adrián y crew!). Básicamente fue una descripción del proyecto que estoy haciendo, donde solamente como el equivalente a una ración de ayuda humanitaria por día para recaudar fondos para ayudar a la hambruna en Somalia. Llevamos poco mas de $6,500 USD recaudados. La cantidad reunida hasta el final del día este domingo 16 de octubre (día mundial de la alimentación) será duplicada (hasta un tope de $10,000) por la agencia de publicidad donde trabajo como planner: Cheil México (gracias a nuestro CEO de América Buz Sawyer, y a Ana Castañeda, nuestra presidenta local). Así que, hasta el domingo sus donativos valen EL DOBLE. Ayúdenme a seguir difundiendo la causa, y si pueden hagan un donativo también (haciendo click aquí ––todas las donaciones van a través de UNICEF directamente). El objetivo original de recaudación de mi proyecto es de $75,000, así que nos falta bastante para llegar. También hay otros proyectos interesantes en 50/50 Make or Break, la iniciativa de la que soy parte (y muy orgullosamente proyecto de lanzamiento) iniciado por Made by Many y g00d for nothing. This morning there was a piece on this project in a national morning news show (1N with Carlos Loret). I was thrilled to see it, and hopefully it will bring more people to check this out and raise awareness of the terrible famine in Somalia. I try to raise money and “earn” your donations by experiencing what eating the equivalent of a famine aid ration is for roughly 50 days. Those 50 days end at sundown on Saturday –and Cheil’s commitment (thanks to Buz Sawyer, our CEO for Americas and Ana Castañeda -president Cheil Mexico) to match donations to my project up to $10,000 ends as well. The fundraising (hopefully) won’t end then, and I’ll be able to continue raising awareness for this urgent issue. If you’ve heard about this through twitter or facebook and are interested in giving, please click here and go straight to the UNICEF project page. Little goblins behind the scenes work out which project the money came from, don’t worry. Thanks for getting involved! Please spread the word and help me get closer to my goal!! OK, so I’m doing this thing where I eat the equivalent of a famine aid ration for around 50 days (more on “around” in a bit) in exchange for your (hopefully) generous donations. All money is handled through UNICEF directly, and it will help save lives in famine-stricken Somalia, where 12.5 million people are at risk of famine; 750,000 are at risk of death soon, and a child dies of starvation every 6 minutes. I cannot accept the concept that this happens, and luckily neither could the awesome folks at @madebymany and @g00dfornothing, who came up with the idea for 50/50 Make or Break ––a series of small bets from folks in the advertising community designed to use our experience in advertising, social media and digital to raise funds for famine aid. The initiative launched on August 27 with the Fat Planner (me!) and will have a symbolic end to coincide with World Food day on October 16th. That date will signal the 50th day I survive on famine rations alone –sometimes with great difficulty (you can read previous posts where I note just how hard it is to live a “normal” life like this). Long story short: I’m getting interviewed this afternoon for a Mexican morning news TV show where @CarlosLoret is the anchor. He actually spent some time in Somalia at about the time this project began, so this feels like fated closure. It is also a super opportunity to spread the word and help this project get up closer to our original target of $75,000. We’re currently at $6,000 and my employer (Cheil) will match all donations up to a $10,000 ceiling. At the VERY LEAST, I would like to get things going up to take advantage of all of it! Best case scenario, the TV show brings lots of exposure and gets us much closer to the target. Please help me to make it happen!! Share this link with your friends on Facebook & twitter… I hate spamming, but this is a worthy cause, and I’m falling on swords all over the place. If you are able, please help me raise money for famine aid in Somalia by clicking on the 50/50 Make or Break orange logo to the left, or just click here to go straight to the UNICEF project page and give. Un día más que como el equivalente a una ración de ayuda humanitaria, un día más que pueden ayudarme a llegar lo más cerca de mi objetivo personal de $ 75,000 USD para aliviar la hambruna en Somalia. Como les conté el otro día, Buz Sawyer, el CEO de Cheil Americas, y Ana Castañeda, presidenta de Cheil México, ofrecieron duplicar lo que consiga reunir con un tope de $10,000 USD. Al día de hoy, el proyecto del “Fat Planner” lleva aproximadamente $6,000 USD. Así que urgen sus donativos para no dejar dinero en la mesa. Todo vale doble hoy! Si decides dar $100 USD, en realidad puedes decir que contribuiste lo doble. Dinero gratis, y para una causa que lo vale. So… Despite the sacrifices, it seems to me at this point in time that the project is almost done. 25-30 lbs later, and with as much satisfaction as can come from a relative failure (in terms of getting to my unrealistic ultra ambitious fundraising target). But as some of the nicest people I know have told me, I really feel it has been a huge success in reminding me of what the important things in life are, and hopefully planting a small seed in my children’s mind that grows into higher awareness and empathy with fellow human beings. As those who have been here before know, I’ve been eating only the equivalent of a famine aid ration for the past 45 days. I feel super proud to have kicked off the awesome 50/50 Make or Break project with @madebymany and @g00dfornothing. I agreed to do this for 50 days to coincide with World Food day, and to raise money for famine aid in Somalia. The situation there is dire, with a child dying every 6 minutes and close to 750,000 people at risk of death by hunger. My guess is that it is hard to understand for most of us in the west just what “dying of hunger” means. My best estimation is that only 1 out of every 1,000 people (if that) actually go into the UNICEF project link and donate. We cannot imagine what it is like to go without food –any of it, because we live in abundance, only limited by our physical and economic access. I ask that you help me spread awareness of this initiative, and of the fantastic projects that run parallel to mine at 50/50 Make or Break. If you are able, please click here (or on the large orange 50/50 square at the top left of the navigation bar) and donate whatever you can for famine aid in Somalia. All donations handled directly through UNICEF. The urgency is great: There are only 5 days left in my project, and my company is matching my fundraising up to $10,000 USD. I would *really* love to make use of 100% of that allotment, and that’s where you come in: I’ve put my money where my mouth is –quite literally donated to myself and have convinced every single one of my friends to pony up for this (thanks guys, you rock!). Please help me in the final stretch!! I would appreciate your help spreading the word, and donating money to the cause. Thanks!!! Special Spanish post by request: take it away @grancomandante! Para quienes no saben qué es esto: Durante 50 días, estoy comiendo exclusivamente el equivalente a una ración de ayuda humanitaria. ¿Por qué? A petición de mis amigos de @madebymany, una extraordinaria agencia de UK que se preguntó si un puñado de publicistas podríamos hacer algo para recaudar fondos para aliviar la hambruna en el este de África. Mi idea fue hacer esto, y bloggear y twittear a cambio de sus donativos (todo el manejo de donativos se hace directamente a través de UNICEF). El blog está en inglés por un simple motivo: La iniciativa surgió entre agencias de USA & UK. Además, yo creía que en el transcurso del proyecto tendría ocasión de postear en ambos idiomas. La carga de trabajo de planner pronto me dejó ver que estaba equivocado. Justo ahora me faltan 10 días. He pasado de todo: cenas de trabajo en restaurante coreano con abundante soju, kimchi y demás que solo vi mientras tomaba agua con gas; el puente del 15 de septiembre con amigos, viéndolos comer; días en que olvidé mi comida y tuve que improvisar con gohan y edamame; la fiesta de lanzamiento de la agencia: #BraveCheil, donde también vi pasar bebidas y canapés al por mayor. Mi objetivo original era recaudar $75 k USD. Al día de hoy, llevo poco más de $5,600 y una gran dosis de humildad y un súper reality check. No es que la actividad no haya sido popular. Todo lo contrario. Pero difusión no es igual a donativos. Según mis cálculos, de cada 1000 personas que lo difunden o retuitean, una sola hace un donativo. Es decir, genera mucha sorpresa y empatía, pero no dinero (indirecta, indirecta!). Igualmente, estoy orgulloso del efecto en mi familia, mis hijos, mis amigos… Y del hecho que de igual forma es mucho más de lo que yo hubiera podido hacer solo. La gente que ha contribuido son los verdaderos héroes de todo esto. Yo solo aguanto el hambre. Aquí es donde entra Cheil, y ustedes. Cheil porque nuestro CEO para América Buz Sawyer y Ana, mi jefa, se comprometieron a duplicar lo que yo consiga recaudar hasta un límite de $10,000 USD. Así que si llegamos, nos acercamos mucho mas al objetivo original. Y aquí es donde entran ustedes –quienes pueden ayudarnos a llegar mas lejos. No vamos a resolver la situación en Somalia, pero podemos juntos hacer una diferencia en la vida de muchas personas. Hay más de 12.5 millones de personas con hambre en Somalia. 750,000 están en peligro de muerte por inanición. Un niño muere cada 6 minutos, mientras nosotros solo tenemos que abrir la despensa, el refri o ir al supermercado. Si puedes hacerlo, por favor ayuda aquí. Since you may or may not have been here before, the executive summary: I am eating the equivalent of a famine aid ration during two months to raise money for famine aid in the Horn of Africa as part of the 50/50 Make or Break initiative from Made by Many and Good for Nothing. There are only 10 days left in my project, and today is the perfect day to give large because our CEO Buz Sawyer and our Mexican boss Ana Castañeda will match my fundraising up to $10k. Hurry and give here!! (All donations handled directly by UNICEF). Some people have asked why I do this, and most importantly wonder if it’s even sane of me to take this experience on, when ‘nothing I do will end the famine or really change anything.’ The reason I come back to this is that upon hearing of Steve Jobs’ passing last night, I suddenly realized just how much of an influence this genius of a man has had in my life. The first computer I ever touched and was allowed to touch was an Apple IIe. Not in my family home, because none of my parents are that technologically inclined, and the cost would have been prohibitive. Many times after that, I came in contact with Apple products, until I started buying them. Every Mac I’ve owned has had a name. I’ve suffered letting go of them when it was finally time to do so. I still have my 1st generation iPod (replaced by a 5G video iPod when my beautiful wife told me it was ridiculous that the biggest Apple freak in the world couldn’t possibly still own and use a device that was exhibited at MoMA NYC –true story), and I sometimes react like a fanboy to Apple criticism. I became a bit of a maven, converting friends and acquaintances to Apple despite the “incompatibility” and “higher prices.” Hell, I even wrote multiple letters and e-mails to Steve asking for a job at Apple, and asked Apple-related questions when interviewing job applicants. True story too. The first time I saw the ‘Think Different’ ad, I got shivers. I figured it was the novelty. It wasn’t. I still get them, every single time. 1984 and Think Different are my favorite ads of all time, and probably played a role in making me wish to be an ad-man, even if I did start my career as a client. What I’m aiming at here, is the fact that I really do believe that we can change the world. You, me, all of us. The proof is that your donation, as small as it may be, can help save lives. Multiple ones. Of the 750,000 people who are at risk of death by famine. You can make a difference in the lives of 13.5 million people who are experiencing what is likely to be the worst drought (and accompanying famine) of their lifetime. You can save one of the children who dies every six minutes. Just click here. Thanks Steve. My personal hero. For the 50 days between Aug. 27 - Oct. 16th (World Food Day), this “Fat Planner” who is 6’4″ and 215lb (1.93m and 97k for those who think metric) and is technically overweight, will only eat the equivalent of a famine aid ration. Everyday. No sweets, no booze, and theoretically no animal protein.